We first encountered Masha and Medved in our Russian language classes in July. Medved is the Russian word for bear, thus Masha and the Bear. It's a very popular children's cartoon here in Russia, which is why we were surprised our teacher played an episode in our Russian class. The title of the cartoon was originally taken from the fairy tale of the same name. I've heard the fairy tale on a Russian language website. It was the story of "Goldilocks and the Three Bears" if you haven't guessed that already. The cartoon series was started in 2009 by Oleg Kuzovkov, a Russian cartoonist. It has now been translated into 25 languages and is available on YouTube. The show focuses on a kindhearted, smart little girl who is also mischievous. One day Masha was walking in the forest and entered Medved's house. Of course, she caused chaos in his house by the time he returned home. But they became best friends. A couple weeks ago, I spent a day with our International Women's Club touring Catherine's Palace gardens while the trees were in full color. The day was windy and dreary - which is very typical for our location - but the garden and buildings were beautiful. I'll share some scenes with you this week. This palace, built in the early 1700's, was the residence of Catherine the Great. She didn't like living in the city of St. Petersburg so built this great mansion out in the country. The gardens around the palace were built around the same time. Today it is a state-owned museum. The breathtaking blue palace was surrounded by acres of gardens including several ponds. Our guide told us that Catherine enjoyed walking in her gardens. She built several pavilions in the large area so she's have places to take her rest after walking so far. I thought that it was silly to turn my key in my Prague apartment three times before the door was unlocked when we lived there, but that was nothing compared to getting into our apartment here in St. Petersburg. I have to turn the key six times before the deadbolt slides out of the lock. They take locks very serious on apartments here. We have three sets of deadbolts on our door. The middle one is only accessed from the inside our flat. The other two sets have keys so they can be locked from the outside. We never even bother with the top deadbolt. That's where my husband stores his keys. St. Petersburg - "Venice of the North"
Before the weather turned too cold, we took the time to check out St. Petersburg by boat. Since this city was basically built on a bog by Peter the Great, much of it is now made up of islands connected by 342 bridges over the many canals and rivers. A terrific way to see the central city is by taking a boat excursion tour. This was a unique view of the 18th and 19th century buildings that line the banks of the rivers and canals. The area, visited by many tourists during the summer, is known by the citizens of SP as the Central City. We passed many beautiful buildings and palaces. Currently, many of these buildings are occupied by universities and colleges. The green building in the picture on the left is the largest drama building in the entire city. It's named the Tovstonogov Bol'shoy Drama Theater. As we rounded a corner into a smaller canal, we glimpsed the blue domes of the Trinity Cathedral. This beautiful church has been added to our "to visit" list. 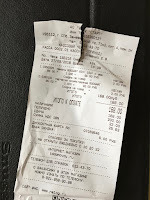 One of the first things that we noted when we arrived here last summer was the unusual ritual that the cashier did with receipt before it was handed to us. The woman made a small tear in the receipt on one end or the other - or maybe even in the middle. The first time it happened, I didn't think too much about it, but it happened over and over again. I tried to figure out why they were ripping my receipt. I finally heard the whole story behind this seemingly odd behavior that was uniformly done in grocery stores or pharmacies or home decor shops. I was told that it's the law, or, at least, used to be the law. Back in the Soviet era, all stores had their products behind the counter. You couldn't go pick out what you wanted like we do today. You had to ask the sale's person to pick out the items you needed.